What runner doesn’t fear being sidelined by pain or an injury? If you do get hurt, kinesiology tape may help you to feel better, and let you work through an injury. 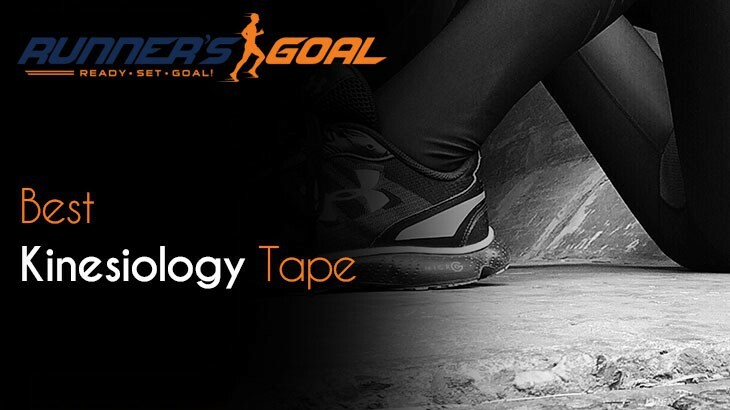 Here is the rundown on how to find the best kinesiology tape and what it can do for you. 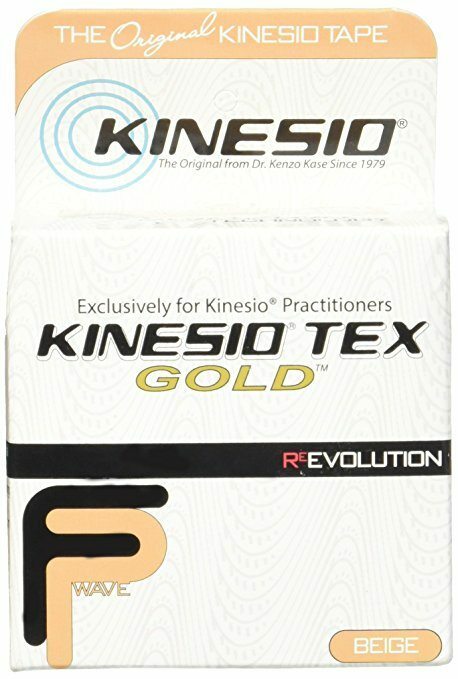 If you have never heard of kinesiology tape, it may be because you haven’t been exposed to it. It was invented in the 1970s, but became popular not too long ago among professional athletes, so is now rather easy to get your hands on. Its purpose is to allow you to be mobile or even work out if you have an injury or condition that causes chronic pain. Of course, there is a little bit of confusion regarding how it does this, but are two main theories. One theory is that it moves the top skin layers, so that any fluid can fill in the extra space and cause relief for injuries. The other theory is that it touches the skin, which essentially confuses the pain signals into not hurting anymore. No matter what the reason is, it may be able to help a variety of ailments. People use it for everything from headaches to bunions, and back pain to fixing posture. It is even used in physical therapy offices and by professionals in the industry. You don’t have to be an athlete to use this product. It can be used for any type of pain as well as a wide array of medical conditions, like carpal tunnel. Each brand of tape can also be used easily by beginners or people that have used this tape before. Some can even be used on animals or by kids who are dancers or participate in recreational sports. There is a science when it comes to using the tape, as it really depends on what you’re using it for. For example, different areas of the body require you to put the tape on differently to get the results that you want. The idea is to create enough tension to provide pain relief, so you may have to do some research to see where to place it and how to get it to stay. There are also videos you can watch for more information. When you’ve decided that you want to use this tape, there are many different types and brands to consider. However, all of them are a bit different. Here’s what to look for to help you decide how to get the best tape for your money. Cotton: The best tapes are made of cotton, so they don’t trap air and make your skin stay moist. This also means that it is a natural solution. Latex free: If you have sensitive skin, you’ll need a tape that is latex free. Many types have no latex and have an adhesive that only sticks when body heat is activated. Water resistance: You’ll want this if you intend to leave the tape on when you shower or if you plan on going swimming. Longevity: If a tape says that it can be used for days, there is a good chance that it stays put whenever it’s applied properly. Another thing you need to know is that it comes in two different forms. There are regular spools of tape like you are used to when you think of regular tape and pre-cut sheets. Neither type is better than the other, but if you are trying to put the tape on by yourself, you may appreciate the strips that are already cut. 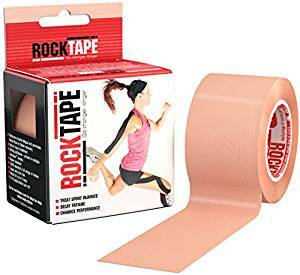 It may be hard to put tape on by yourself, especially if you need it placed on your back or another area that is hard to reach. You may want to get a second pair of hands to help you out. Another very important aspect of this tape is that it comes in many different colors, patterns, lengths, and widths, so there are a lot of variations you can purchase it in. The standard is around 2 inches wide, which is the same as something like duct tape. Some people think that it may not work or that it is simply a placebo effect, whereas many others can’t live without it and use it every day of their lives to get relief. It is up to you to decide if it works for you. It is not a miracle drug and you should still seek medical advice and treatment when you think you need it. If you want to try it, I recommend trying more than one brand before you determine if it works or not. It is possible that all types work a little bit differently, so even if one brand doesn’t do the trick, another brand might. Each type has different elastic properties and can offer you a different experience. Won’t peel off: This tape is unlikely to peel off, even after a few days. It will stay in place wherever you put it, so it should keep relieving your pain. Waterproof: It won’t peel off when it gets wet or if you go swimming, because the adhesive is powerful. No worries if you have to use it in less than perfect conditions or shower when you have it on. Money back guarantee: There is a money back guarantee on the product, so if you aren’t satisfied, you can simply contact the company to get a replacement or a refund. Ebook included: A special ebook comes with the purchase of this product, which gives you tips and tricks to use, allowing you to have a better user experience. Comes in a roll: This one comes in a roll that is 16.5 feet long and 2 inches wide. This means you can make the tape sizes the length you need them to be. Not a great choice for sensitive skin: Since the adhesive is designed to stay in place for such a long time, there may be some issues for people with sensitive skin or those that are pregnant. Comes in different colors and designs: This tape comes in so many different colors as well as designs, and most of them are quite vivid and bright. Extremely elastic: It is designed to work with human skin. It stretches like elastic to allow you to move and stretch. Precut strips: This product consists of over 16 feet of precut strips. There are 20 of them, each of which is 10 inches. It even comes with a container to hold it in. Has reflective designs: One of the coolest things about this product is that it has reflective designs, which are integrated into the solid colors as well as the prints. 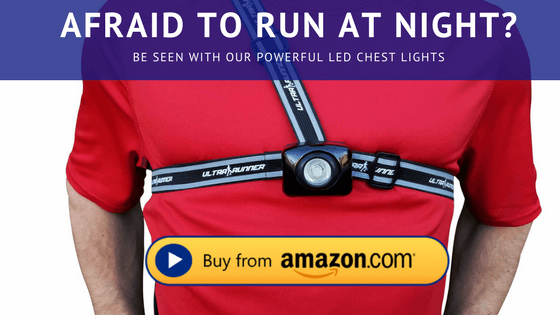 This means you will be highly visible when you’re using it at night, in case you forget to wear other protective reflective clothing. Can unravel quickly on some users: The product is designed to be used for up to 5 days without any problems, but it may come off or roll up before then. It can also fray so much that you’ll want to take it off. This doesn’t always make it less effective however. Hypoallergenic: This product is unlikely to cause any allergic reactions or rashes, except in serious cases. It also comes in over 30 different patterns and colors. Made of mostly cotton: It is comprised of nearly 100 percent cotton, along with a tiny bit of nylon to help with the stretch. This also allows for it to be quite breathable, so your skin underneath should not get too dried up or pruney while you wear it. Has 100 percent stretch: The stretch essentially allows you to be able to move, work out, or go about your day without the tape failing. Contains no latex: This is a latex free tape, which also doesn’t contain any zinc. These things can cause rashes on people sensitive to zinc. 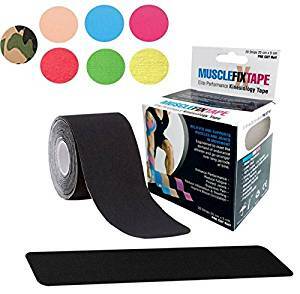 Can stay on for up to 7 days: The adhesive is very powerful and can allow you to keep the tape on for up to 7 days, even if you sweat or take a shower. However, this is a bit dependent on when you put the tape on. Doesn’t work the same for all body parts: There are parts of the body that the tape has a hard time sticking to, like the feet and hands. Has acrylic adhesive: This is a hypoallergenic alternative to latex adhesive. It is also heat activated, so it will stay put when you put it on your skin and it starts to heat up. Keeps moisture away from skin: It’s also designed to make sure that any moisture or water stays away from your skin. It has specialized grooves to help with that. This also allows for you to be able to use it for a longer period of time, up to an entire week. Made of 100 percent cotton: It is made of cotton only, so it is natural and not full of weird chemicals. Won’t leave residue on the skin: When you take off the tape, there won’t be a lot of adhesive or mess left on your skin. Comes on a handy roll: This one comes on a roll that is enough to use about five times, depending on how much you need to use. May be hard to remove: Since the tape is so strong and moves well with your body, it may be hard to remove after a few days, depending on where it was placed. Medical grade: This is a professional grade product that is made well. It consists of cotton and spandex, so it should function well when you use it, even if you have to move around a lot. Cut into handy strips: The tape is already cut into strips that you just rip off and place. The box functions as the tape dispenser so that the tape doesn’t become dirty or damaged. Comes with instructions: There are also instructions in the box, so you can have a better understanding on how to place the tape on your body in the proper manner. It features pictures of applications for some of the most common injuries. Very breathable: The tape does allow for some air flow, which helps if you plan to wear the tape for an extended period of time. It also means less of a chance of adverse skin reactions. May not stay on for days: Even though it is designed to be used for around three days, it may not work that long for you. It depends primarily on where it is placed and if it is placed properly on the skin. 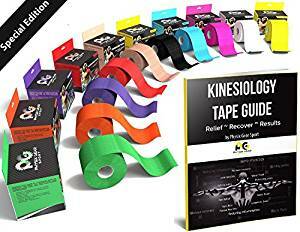 The RockTape Kinesiology Tape for Athletes is my favorite kinesiology tape of all those we listed. It performs really well when it comes to keeping your skin dry, and it is made of mostly cotton. Besides that, it is not likely to cause an adverse reaction. It can be kept on the body for up to 7 days. This makes it highly effective. It also comes in some really cool colors and patterns, so you can pick the one you like the best. It may improve so many different conditions when used properly, and it mimics human skin when it comes to movement.